Celebrating a new baby is the BEST. I get so excited about new babies, that when it was near time for the new Simmons baby to be born, I jumped at the chance to be able to host a shower in his honor. 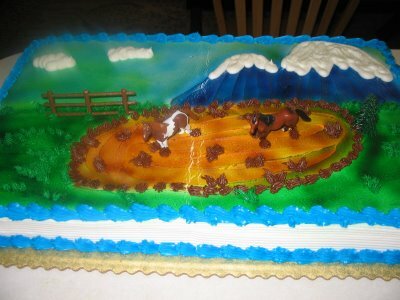 Scott and I decided to make it a Western theme to match both their daughter's main interest (horses!) and the location (Lehi, a real cowpoke kind'a town). We didn't take any pictures AT the shower, but I did take some beforehand of some of the details that Scott and I put a lot of love into. I had a friend bring his horses and wagon to give all of the children rides. We decorated the pavilion at the park right across the street from our house with checkered table cloths, mason jars with tea lights, and then we put these floating candles and cowboy hats in bowls on each table. We then tied sunflowers around the poles with twine. I found those floating candles for just .99 on ebay... it's amazing what you can find on ebay and Amazon when it comes to finding supplies for a shower! Mason jars made for the most darling candle holders. I used this idea from Martha Stewart since the shower was outdoors. We purchased the edible cake for really inexpensively from an Albertson's bakery. 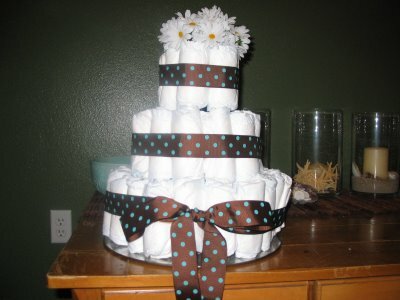 I made the diaper cake with the cowboy theme in mind. I just put some silk daisies in the top. Inside were bottles filled with the mother's favorite obsession: Dove chocolates. 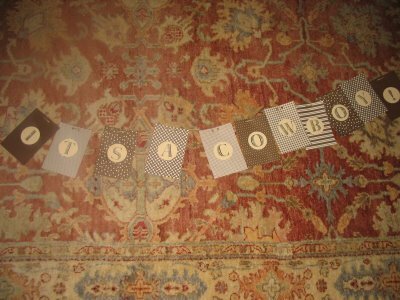 The sign was another Martha Stewart inspiration. I simply printed out her lettering onto off-white card stock, cut them out and then glued them to scrapbook pages cut into quarters. Then I punched two holes in the top of each card and weaved the twine through it. You can download the letters for free here. For the goody bags, I found some miniature muslin bags at Roberts Crafts. 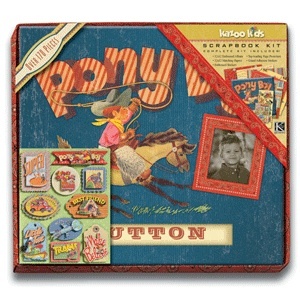 I also purchased from there some Western-themed stamps and a copper ink pad to stamp onto the bags. We put two Hershey's Nuggets in each one and tied them (they come with ties already). 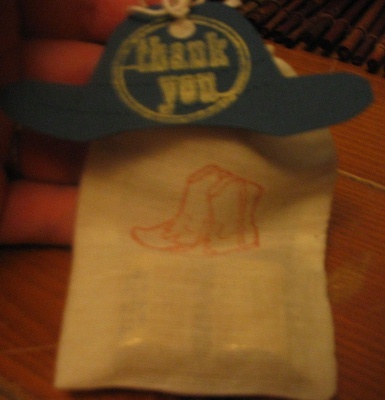 Then we made out of navy blue card stock some cowboy hat die cuts and stamped "Thank You" in gold ink. As for the guest book, that was the very best part. Since their baby had already been born, and they had a professional photographer take pictures of the birth, I was able to contact their photographer and get pictures from her. My mother helped me create scrapbook pages for them with the pictures on them. The mother hadn't even seen the pictures herself, yet, so that was a nice surprise. We then had everyone write their best wishes and advice on tags to stick inside the pockets of the scrapbook. The best part of the night, though, were the guests. It was so wonderful to just watch everyone socialize and to see the children play on the playground. Not a care in the world that night, I swear. I couldn't have asked for a better turn out! I love all of the little details you shared with everyone! It looks like it was a wonderful baby shower. Congrats on hosting a great party!